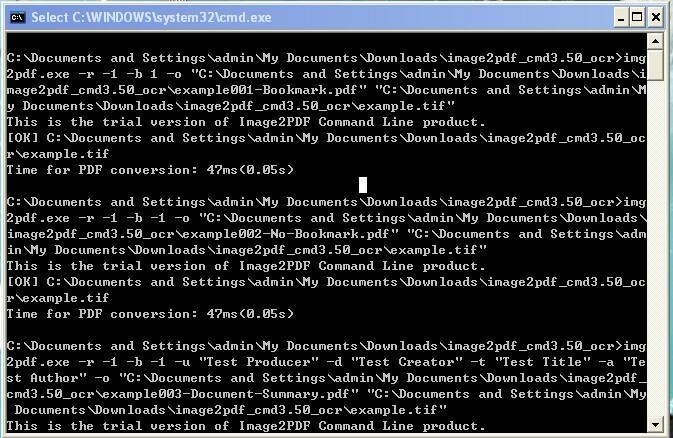 Image to PDF OCR Converter Command Line is an easy-to-use software for convert image to PDF file via OCR by Command Line. Convert image files to PDF files, it supports TIF, TIFF, JPG, JPEG, GIF, PNG, BMP, PSD, WMF, EMF, PCX, PIC, etc. formats. It can convert scanned PDF file to plain text PDF file, it can also make a scanned PDF file from signed PDF or filled PDF file. It does use JBIG2 and JPEG2000 compression to compress PDF files smaller.VeryPDF Image to PDF OCR Converter Command Line has following features,1. You can customize description of created PDF, such as title, subject, author, and keywords.2. This program is independent of a third-party PDF reader or creator.3. Make searchable PDF from images with OCR by command line.4. Create searchable PDF directly from scanned images like TIF, JPG, PNG, etc.5. Support unattended conversion for files in specified directories.6. Encrypt created PDF with user password or/and owner password of 48 or 128-bit.7. Combine multiple images into one PDF.8. Able to insert or append newly converted PDF to existing PDF.9. Automatically preview converted PDF with an associated application.10. Convert text based PDF files to scanned PDF files, simulate the scanner.11. Extract a page range from PDF file and save to a new scanned PDF file.12. Enhanced OCR engine to convert from scanned PDF file to searchable PDF files.13. Convert color PDF file to grayscale or black/white PDF file.14. Make scanned PDF files from signed PDF files.15. Convert image to PDF or PDF to image with more options.16. Support JBIG2 and JPEG2000 compression methods. Emicsoft BlackBerry Converter Suite contains Emcisoft DVD to BlackBerry Converter and BlackBerry Storm Video Converter which can rip DVD movie to BlackBerry and converter all popular video/audio formats to your phone.